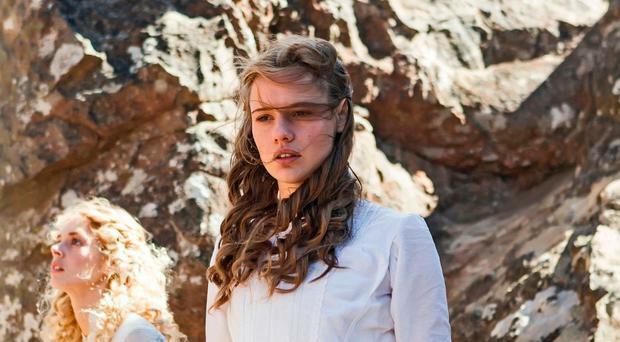 Picnic At Hanging Rock is such a quintessential Australian novel that some believe it's a true story. Now, over 50 years since Joan Lindsey's book was first published, the tale of the mysterious disappearance of three schoolgirls and their governess on Valentine's Day, 1900, has been re-told for a six-part series airing on BBC Two. "I thought the way this whole community and school had been fleshed out between the lines of what is present in the novel was wonderful," says Game Of Thrones star Natalie Dormer, who plays Appleyard College's enigmatic headmistress, Hester Appleyard. "There is a magic that we have very much injected into our re-imagining of Picnic At Hanging Rock, one that is hopefully very faithful to the tone of the novel." For Reading-born Dormer (36), the biggest mystery of the whole series is her character, who moved to Australia at the end of the 19th century to give herself a new identity. "We slowly reveal the ghosts and the baggage of that past, who she is and this little kingdom that she has created 10,000 miles away from home to hide from her past," she says. Meanwhile, Queensland actress Lily Sullivan, whose roles include the film Sucker, alongside Timothy Spall, plays Appleyard College student Miranda. "She's earthy, strong, opinionated. I think that comes from growing up on a farm with four brothers, totally treated as an equal, gender does not apply whatsoever," the 24-year-old says. "I think, out of all the girls, she's really tasted the notion that women are equal to men." Former Home And Away star Samara Weaving takes on the role of Irma, a prize recruit of Appleyard College who "likes beautiful things". As the 26-year-old, who was born in Adelaide, notes: "There's the obvious, narcissistic side to that, which is that she likes jewels, wears the fanciest clothes and gets things imported from France. "But on the flip side, Irma wants the world to be beautiful, she wants it to have a heart and to be sparkly." Their "total bookworm" classmate, Marion, is portrayed by 21-year-old indigenous actor Madeleine Madden. "She's also really brave and follows her heart. She isn't afraid to show who she really is," she says. Finally, Ruby Rees tells us about playing Edith Horton, both the school dunce and a know-it-all. "She wants to be a part of everything and she wants to be in the middle of all the action," explains the young Aussie. "She wants to go on adventures a lot of the time, sometimes to her own detriment." The cast seem passionate about the way the famous story has been adapted for a modern audience. "Growing up, it was my mum's favourite film, so I had seen it a bunch of times," Sullivan says of the 1975 film version of Picnic At Hanging Rock. "As a kid, there was that haunting element, but then also the beauty of it. "I think we are taking a classic and a beautiful period piece and destabilising it. It's also following powerful, beautiful, strong, twisted, tormented, flawed women." Weaving points out: "It's not ethereal and feminine like the film, this is really rock and roll. It's punky and punchy. It's going to be so awesome and badass." Across the episodes, issues of repression and sexuality, freedom and suffocating respectability are explored. Rees says that making the novel into a TV series today means the story is being approached with a "current perspective". "Some of the stuff we're doing in the scenes, we feel now that it's outrageous and we can't believe some of the things that these girls are going through," she adds. "To have that in your mind when playing these people who didn't know any different is interesting, and informs the performance." Something Rees thought was really good about this shoot was the number of women on it. "We've got this powerhouse cast of amazing females," she says. "Both of the writers are females and we have two female directors. "The more time I spent in pre-production and started to realise who I'd be working with, the more excited I became." Madden, meanwhile, embraced the chance to play a female character "not often spoken about, or celebrated in history", but who "definitely would have paved the way for society and women". "I did have to do a lot of research into how women spoke and what roles women like Marion had in society," she says. "I did a bit of research into the women from the British Indian colonies to see what their roles were. They were perceived as being quite exotic - a bit of an outsider." Madden goes on to discuss how difficult it would have been to live in that era. "Especially for women... they had no control over their bodies, or what they wanted to do, or who they wanted to marry," she says. "That was all up to somebody else." Perhaps one of the stand-out features of this series is the Rock itself, a striking geological formation found about an hour outside Melbourne. "The day before my final audition I went to the Rock for the first time and started running my lines dramatically while having a picnic on one of the big, giant boulders, looking out onto the horizon," Sullivan recalls of preparing for the role. "It was wonderful." Weaving echoes this sentiment when she says: "Filming at the Rock was really exciting, because I'd never been there before and you do feel this sense of magic." And the significance of the place for indigenous communities cannot be ignored. "It was really important for me to be welcomed to the Rock by the clans that surround the Rock," says Madden. And what about Dormer? How did she find the experience of filming Down Under? "This was my first trip to Australia, so to stand in the Macedon region and look out over the Hanging Rock made a big impression on me as well," she says. "No acting required. I was overwhelmed by the beauty and scale of Australian landscape."